Barrier islands are coastal landforms and a type of dune system that are exceptionally flat or lumpy areas of sand that form by wave and tidal action parallel to the mainland coast. They usually occur in chains, consisting of anything from a few islands to more than a dozen. They are subject to change during storms and other action, but absorb energy and protect the coastlines and create areas of protected waters where wetlands may flourish. A barrier chain may extend uninterrupted for over a hundred kilometers, excepting the tidal inlets that separate the islands, the longest and widest being Padre Island of Texas. The length and width of barriers and overall morphology of barrier coasts are related to parameters including tidal range, wave energy, sediment supply, sea-level trends, and basement controls. The amount of vegetation on the barrier has a large impact on the height and evolution of the island. Sand carried by the offshore moving bottom current is deposited where the current reaches the wave break. Other longshore bars may lie further offshore, representing the break point of even larger waves, or the break point at low tide. There are two common definitions of coastal erosion. It is often defined as the loss or displacement of land along the coastline due to the action of waves, currents, tides, wind-driven water, waterborne ice, or other impacts of storms. In this case, landward retreat of the shoreline, measured to a given spatial datum, is described over a temporal scale of tides, seasons, and other short-term cyclic processes. Alternatively, it is defined as the process of long-term removal of sediment and rocks at the coastline, leading again to loss of land and retreat of the coastline landward. Coastal erosion may be caused by hydraulic action, abrasion, impact and corrosion by wind and water, and other forces, natural or unnatural. A tombolo, from the Italian tombolo, derived from the Latin tumulus, meaning 'mound', and sometimes translated as ayre, is a deposition landform in which an island is attached to the mainland by a narrow piece of land such as a spit or bar. Once attached, the island is then known as a tied island. A tombolo is a sandy isthmus. Both headland and bay are two coastal features that are related and often found on the same coastline. A bay is a body of water—usually seawater and sometimes fresh water— mostly surrounded by land, whereas a headland is surrounded by water on three sides. 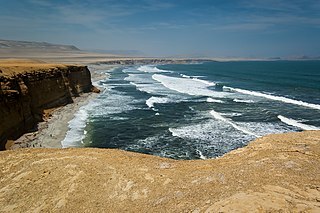 Headlands are characterized by breaking waves, rocky shores, intense erosion and steep sea cliffs. Bays generally have less wave activity and typically have sandy beaches. Headlands and bays form on discordant coastlines, where the land consists of bands of rock of alternating resistance that run perpendicular to the coast. Longshore drift from longshore current is a geological process that consists of the transportation of sediments along a coast parallel to the shoreline, which is dependent on oblique incoming wind direction. Oblique incoming wind squeezes water along the coast, and so generates a water current which moves parallel to the coast. Longshore drift is simply the sediment moved by the longshore current. This current and sediment movement occur within the surf zone. Coastal morphodynamics refers to the study of the interaction and adjustment of the seafloor topography and fluid hydrodynamic processes, seafloor morphologies and sequences of change dynamics involving the motion of sediment. Hydrodynamic processes include those of waves, tides and wind-induced currents. Cuspate forelands, also known as cuspate barriers or nesses in Britain, are geographical features found on coastlines and lakeshores that are created primarily by longshore drift. 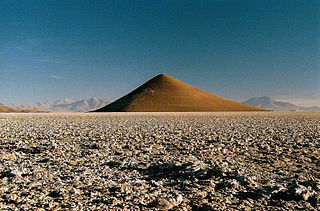 Formed by accretion and progradation of sand and shingle, they extend outwards from the shoreline in a triangular shape. Some cuspate forelands may be stabilised by vegetation, while others may migrate down the shoreline. Because some cuspate forelands provide an important habitat for many flora and fauna, effective management is required to reduce the impacts from both human activities and physical factors such as climate change and sea level rise. 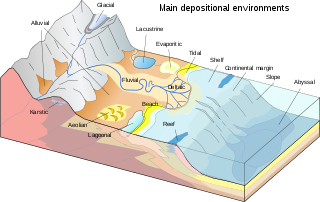 In geology, depositional environment or sedimentary environment describes the combination of physical, chemical and biological processes associated with the deposition of a particular type of sediment and, therefore, the rock types that will be formed after lithification, if the sediment is preserved in the rock record. In most cases the environments associated with particular rock types or associations of rock types can be matched to existing analogues. However, the further back in geological time sediments were deposited, the more likely that direct modern analogues are not available. Sedimentary budgets are a coastal management tool used to analyze and describe the different sediment inputs (sources) and outputs (sinks) on the coasts, which is used to predict morphological change in any particular coastline over time. 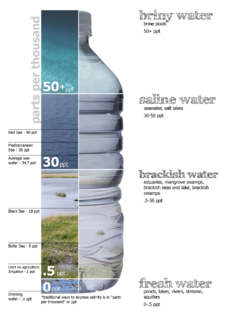 Within a coastal environment the rate of change of sediment is dependent on the amount of sediment brought into the system versus the amount of sediment that leaves the system. These inputs and outputs of sediment then equate to the total balance of the system and more than often reflect the amounts of erosion or accretion affecting the morphology of the coast. Sedimentary structures include all kinds of features formed at the time of deposition. Sediments and sedimentary rocks are characterized by bedding, which occurs when layers of sediment, with different particle sizes are deposited on top of each other. These beds range from millimeters to centimeters thick and can even go to meters or multiple meters thick. Canterbury Bight is a 135 kilometres (84 mi) stretch of coastline between Dashing Rocks and the southern side of Banks Peninsula on the eastern side of the South Island, New Zealand. The bight faces southeast, which exposes it to high-energy storm waves originating in the Pacific Ocean. The most frequent wave approach direction for the Canterbury Bight is from the southeast and the most dominant the south with wave heights of over 2m common. 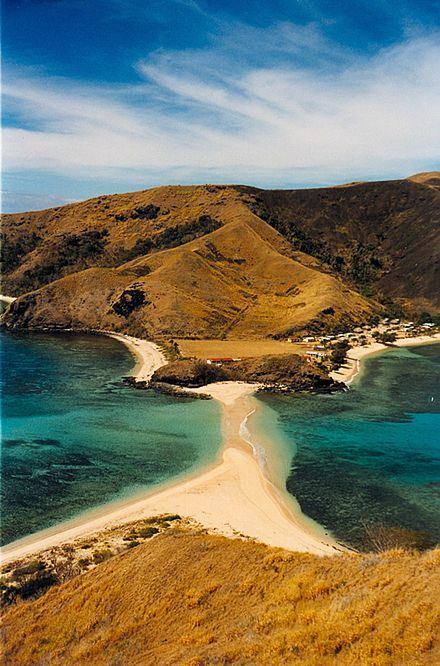 The bight is a large, gently curving bend of shoreline of primarily mixed sand and gravel (MSG) beaches. The MSG beaches are steep, highly reflective and composed of alluvial gravel deposits. The alluvial gravels are the outwash products of multiple glaciations that occurred in the Southern Alps during the Pleistocene. Large braided rivers transported this material to the edge of the current continental shelf, which, due to sea level rise is 50 km seaward of the coasts current position. 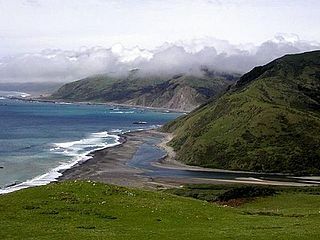 The MSG beaches of the Canterbury Bight therefore occur where the alluvial fans of the Canterbury Plains rivers are exposed to high-energy ocean swells. The dominant rock ‘greywacke’ in the Southern Alps is consequently the primary constituent of the MSG beaches, which is partially indurated sandstone of the Torlesse Supergroup. River-mouth lagoons are a relatively common occurrence on the MSG beaches of the Canterbury Bight. At a flat coast or flat shoreline, the land descends gradually into the sea. Flat coasts can be formed either as a result of the sea advancing into gently-sloping terrain or through the abrasion of loose rock. They may be basically divided into two parallel strips: the shoreface and the beach. ↑ D Rutecki, E Nestler, T Dellapenna, and A Pembroke, 2014. Understanding the Habitat Value and Function of Shoal/Ridge/Trough Complexes to Fish and Fisheries on the Atlantic and Gulf of Mexico Outer Continental Shelf. Draft Literature Synthesis for the U.S. Dept. of the Interior, Bureau of Ocean Energy Management. Contract # M12PS00031. Bureau of Ocean Energy Management, U.S. Department of the Interior. 116 pp.